As educators, we have many external expectations placed on us, which often makes it difficult to pursue projects we are passionate about. In school we get caught up in a routine, and our students can end up doing the same. Routines can be productive, but once they become monotonous, that can be the opposite of what the educational experience should be or could be. A planned (but for the students, unexpected) experience can provide an antidote. Such events are often the most memorable experiences that students have while in school. As a school counselor for the past 13 years at Jersey City Public Schools, I feel that one of my primary roles is to create and facilitate these experiences. The beauty of an event is that it becomes a truly shared experience in which parents, students and educators join in a positive endeavor from beginning to end. Everything from the planning stage to the day of the event, to the reflections on it afterward, allows for the event to become a long-term memory in the lives of the students. Space is created for enthusiasm, decision-making and growth. All educators, including school counselors, can make their academic years more exciting if different types of events are scheduled for their students and families. I am a member of the American School Counselor Association (ASCA), which partnered with Michelle Obama to provide free tickets to her Becoming Book Tour. The intent of the partnership was to enable students who grew up in the same sort of community she grew up in to be able to hear her speak. Ticket winners committed to taking four students to the event, free of charge, and share the experience with ASCA. I was not confident that I would get the tickets, but I saw an email from ASCA as I was waiting in line at the temple during the Hindu New Year. I thought to myself, "Just take a chance!" Lo and behold, I was one of only five school counselors chosen out of the 70 who entered in the Philadelphia area. I was so ecstatic that I reached out to my administration and central office for approval of the trip to ensure that it could happen. Fate intervened yet again when, the board of education cancelled its meeting, giving us time to submit an addendum request for the trip and for transportation. This was a once in a lifetime opportunity that I did not want our students to miss. I tried to work in the system as best I could in a very small window of time, and by using my optimism and excitement as my catalysts, got all approvals in place quickly. Knowing I could only select four of our students to attend, I chose the students based on attendance. The Renaissance Institute is the alternative, credit-recovery program for the Jersey City Public Schools. Our students come from six of the comprehensive high schools in Jersey City and are catching up on their credits to graduate with their class cohorts. They come with academic, personal, social, and/or emotional issues that have shifted their secondary careers. Many of our students had attendance issues prior to coming to Renaissance, so I wanted to recognize and reward the students who now come to school the most consistently. The experience was incredible from beginning to end. When the students found out they were chosen to go, they were thrilled, as were the parents when I informed them. A couple of parents thought something negative had happened when I reached out, but when I explained the reason for the call, they were also elated. We had a long bus ride in store from Jersey City to Philadelphia, so we had dinner beforehand and packed the bus with snacks before leaving. We talked about Ms. Obama’s book and took pictures. The students were professionally dressed for the event and were excited. Once we arrived, we took time to talk to one another. As a result of my post to Twitter, the students even saw their picture up on the big screen at Wells Fargo Arena. Obama’s conversation on stage was wonderful. She addressed various topics, including her experience with her college counselor, her marriage, and race. She shared excerpts from her book. We were seated near other students and school counselors. When we returned to the bus, we talked all the way to Jersey City. I felt like I had one of the best school counseling group sessions with my students on that bus. We spoke on a wide range of issues from college to pets to school activities. The experience united us, and we grew closer as a group. I believe it strengthened the students’ friendships and allowed them to develop more positive energy in and for our program at the Renaissance Institute. We reached school at about midnight. It was late, but we all went home a little more enlightened than when the day began. As a follow-up in school, we had a reflection roundtable session with the students. We ordered their favorite foods for lunch, and I pulled some quotes from Obama’s event and her book for the students to think about and demonstrate how they may have seen her words resonate in their lives. One of the students asked me if they needed their Chromebooks for the session. I told him that I would rather they use their paper and pens and write. I often hear how handwriting allows for a freer flow of thoughts and is a better process overall. I wanted the students fully engaged in this process. Students are constantly on devices for socializing and for schoolwork, so this was a perfect opportunity for them to use their handwriting for expression. I also sought the reflections from the parents. This was important because it gives parents a chance to provide input, giving us an opportunity to improve and look for more such opportunities in the future. If the parents feel invited and engaged, a sense of community is built. This affects every aspect of the students’ educational time with their teachers and all staff at the school. 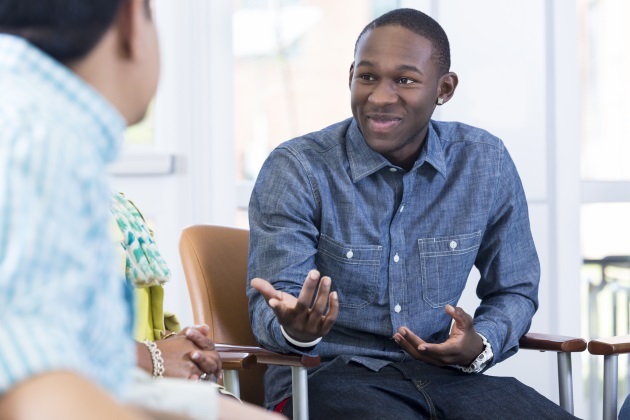 There are many ways to replicate a project such as this for any school counselor or educator, whether you are a counselor running a book club group, facilitating a classroom guidance activity or even on an individual counseling level. An opportunity to see a former first lady does not come along every day, but there are always events happening, such as book signings, lectures at a university, local author presentations and talks by local artists. Keep an eye out for posted fliers or events in your social media feed. Don’t be so quick to delete those emails you get from the organizations you are a member of, you never know what opportunities are just sitting in your inbox. Do not be afraid to enter contests and apply for opportunities yourself. While I used attendance as a criterion because the number of tickets I received were limited, other educators might hold an essay contest where attendees are chosen to see someone prominent. The odds of you winning may be better than you think, and you and your students may end up at an event you never imagined you would be able to attend. Sweety Patel has been a School Counselor for Jersey City Public Schools for the past 13 years. She has a Bachelor of Arts degree in Psychology and International Studies from Case Western Reserve University in Cleveland, and a Master of Science degree in School Counseling from The University of North Carolina at Greensboro. She currently works at Renaissance Institute, the alternative credit recovery program for the high school students of Jersey City Public Schools, and U-CAN Academy, the interim educational setting for students graded 4-12 who have extended suspensions (formerly Zero Tolerance) as part of Jersey City Public Schools.